Making butternut squash in a slow cooker is ridiculously easy and we’re all busy… Right? We need some easy in our lives when it comes to food, but we don’t want to sacrifice flavor or nutrition at the same time. Enter: slow cooker. I am blogging this insanely easy process because there was a time when I didn’t know about it and figured there might be some of you who don’t know either. Tip one… Use a sharp knife. It’s not easy cutting a butternut squash in half (lengthwise) unless you have a sharp knife. Here’s the one I’ve been using for about 9 years. 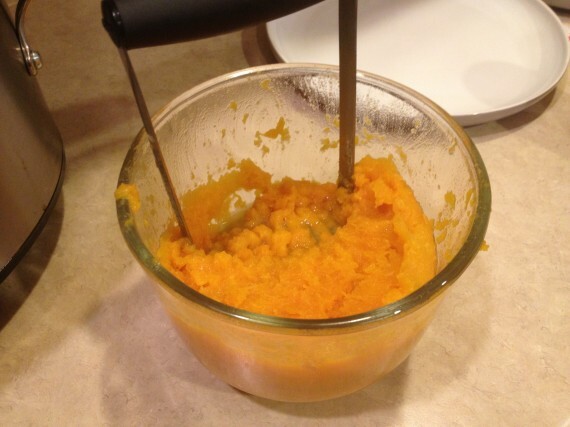 Tip two… It appears that raw butternut squash can cause an allergic reaction on some people’s skin, mine included. I was peeling and chopping butternut squash one time for chili and my bare hands, of course, were being used in handling it. About a half hour post-kitchen time my hands felt weird and looked kind of shiny, like they had a papaya enzyme mask on them or something. The skin felt tight and weird. After googling, it appears it’s an allergic (usually harmless, if not annoying) reaction to handling butternut squash. As a result, I don’t peel and chop it anymore. I cut it in half for minimal skin exposure, and toss it in the slow cooker. And, I wash my hands well after that. 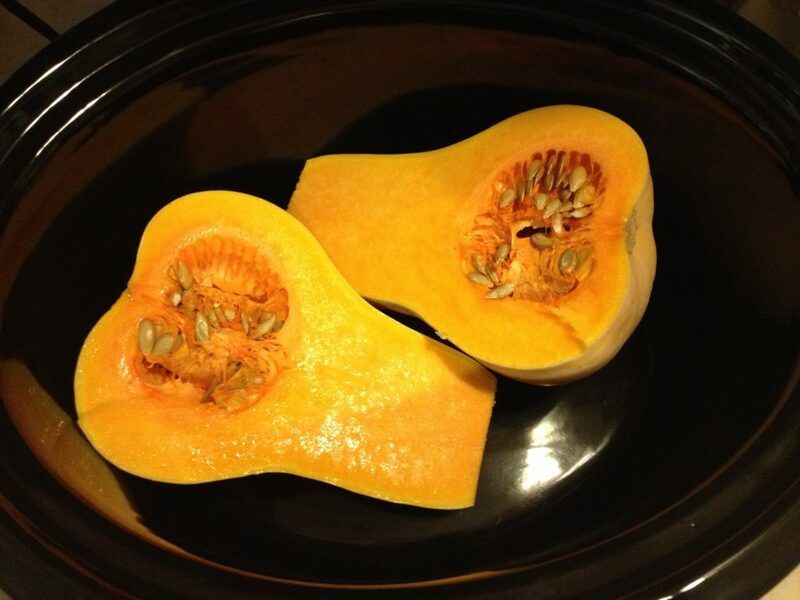 Butternut Squash in my slow cooker. Here’s how you cook butternut squash in a slow cooker. Take a butternut squash and slice it lengthwise down the middle. Put it in your slow cooker (I usually use a 6 quart or 7 quart size), skin side down. Cover the slow cooker. Cook on LOW for 6 to 8 hours or HIGH for 4 to 6 hours. Scoop out seeds and discard. Scoop out flesh, put in a bowl, add seasoning and grass fed butter (if desired). Smash it up. Done! Eat as is, add to soups, serve as a side with a snazzy sauce on it, or spread on paleo bread.